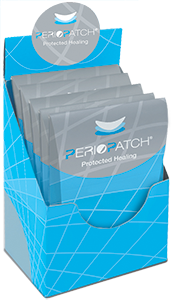 PerioPatch® by is a unique oral health product that acts as a barrier and provides relief from the signs and symptoms of oral inflammation and trauma. The hydrogel patch absorbs wound exudates, and reduces gingival inflammation, thereby promoting natural oral wound healing. The concept of absorbing wound exudates to facilitate healing is used in many areas of medicine—from the battlefield to the operating room. PerioPatch® forms a protective seal over inflamed gingiva and irritated oral tissues, and provides protection from further irritation that may be caused by normal activities, such as eating and speaking.